The Queue tab is actually an email inbox for the database. The idea is if someone needs something done to the database they can send instructions to the database and database administrators directly via email. Other uses include having receipts forwarded to the inbox and receiving record update requests from database users without the necessary data entry credentials. The Queue can also glean data from emails to quickly add to the Input tab. The Queue is accessed directly by tab. There are three areas to the queue module. The first is the email list, the second is the email display area, and the third is the links for gleaning information. This is the area which contains the email subject, sender, return address and date. Clicking anywhere on the row that contains the email header information will display the email below. 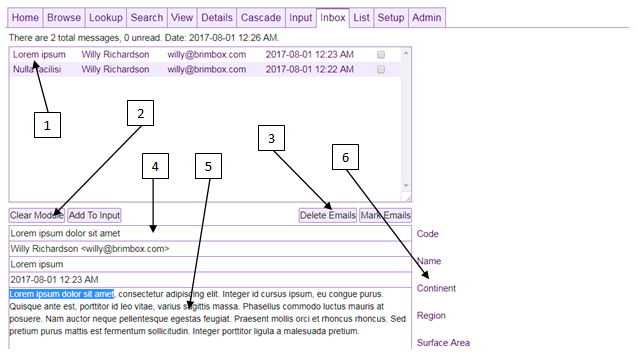 The Clear Module button removes the email from display, and the Add to Input button adds data gleaned from the email to the Input tab. The Delete Emails button deletes checked emails from the Queue and Mark Emails button marks checked emails as unread (they then appear bold and underlined). The clipboard area holds information that is currently selected (or highlighted) from the email subject or body. When a glean link for a field (see number 6) is clicked the text from the clipboard will be attached to that link. When the Add to Input button is clicked the data will then be added to the corresponding input field. This is the body and subject area of the email chosen from the email list. The subject of the email can have an affect on the glean links and the state of the input tab. Certain subjects, used in the standard Guest and Viewer packs, will cause the input into a particular state including an Add Child state and the Edit state. The glean links once clicked will take and hold text selected to the clipboard until the Add to Input button is clicked. This is so data can quickly be transferred form a queue email to the input tab for data entry.